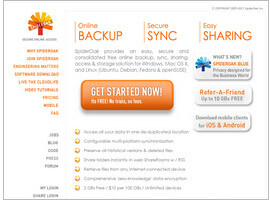 SpiderOak provides syncing and shared online file repositories along with backup. SpiderOak not just supports Mac, Windows, Linux platforms but Android N900 Maemo and iOS mobile platforms also. Their initial release of the service was made in December, 2007 – since then they have released four stable versions designed to meet the user's preference in a better way. Their threefold functionality store, sync and share can be availed for $ 100 per annum for 100 GB. User can sync and access data from unlimited number of systems and SpiderOak will retain unlimited versions of your revised file. Data pass through a process of high level encryption before sending and after receipt.SpiderOak was selected as Editor’s Choice by Computer Shopper in May, 2009. It was also rated as Awesome by MacLife magazine in 2009. SpiderOak Reviews: SpiderOak is a zero-knowledge encrypted Cloud data backup Service Provider, share and sync, access and cloud storage service. Online and multi-platform.